HA #4 of 7: “Trust Master”…. Henneth Annun, Pt. 4: Frodo calls to Sméagol at the Forbidden Pool. The book excerpt below is rather long. If you’d rather not read it, the bit of film script is below it, followed by the caps. 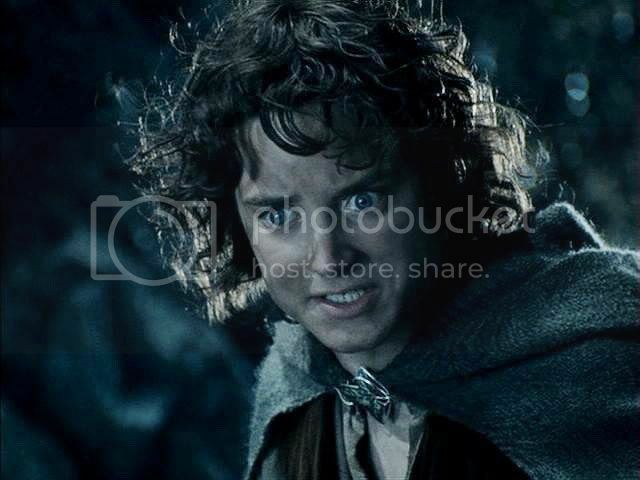 Frodo crept forward, using his hands Gollum-like to feel his way and to steady himself. The rocks were for the most part flat and smooth but slippery. He halted listening. At first he could hear no sound but the unceasing rush of the fall behind him. Then presently he head, not far ahead, a hissing murmur. So it went on, almost as unceasing as the waterfall, only interrupted by a faint noise of slavering and gurgling. Frodo shivered, listening with pity and disgust. He wished it would stop, and that he never need hear that voice again. Anborn was not far behind. He could creep back and ask the huntsmen to shoot. They would probably get close enough, while Gollum was gorging and off his guard. 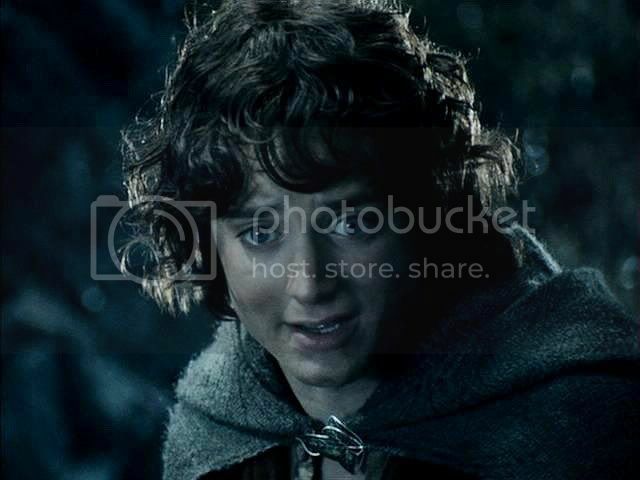 Only one true shot, and Frodo would be rid of the miserable voice for ever. But no, Gollum had a claim of him now. The servant has a claim on the master for service, even service in fear. They would have foundered in the Dead Marshes but for Gollum. Frodo knew, too, somehow, quite clearly that Gandalf would not have wished it. ‘Sméagol! he said, a little louder. The voice stopped. ‘Sméagol, Master has come to look for you. Master is here. Come, Sméagol!’ There was no answer but a soft hiss, as of intaken breath. I think this scene was translated quite well into film. The bulk of the book dialogue was cut, leaving a bare but efficient structure of words, but, yes, it worked well. The scoring under the scene (and all of the Henneth Annun scene) suited perfectly. The lighting wasn’t nearly as dark as it was in the book, but that was to be expected. Visual beauty was the gain, the scene glimmering with moon light, but the sense of Frodo listening to this nasty voice in the dark, almost as if he were listening to the darkest part of himself fingered into life and made larger by the workings of Sauron through the Ring, is lost. 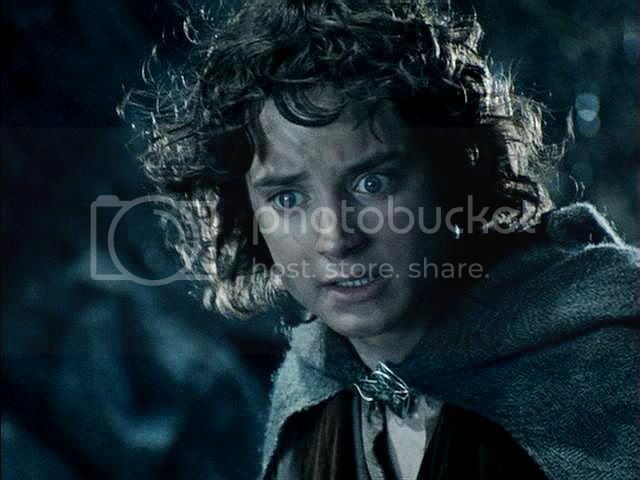 Not that the book says that Frodo experiences the voice of Gollum as part of himself, and perhaps Tolkien intended no such thing. 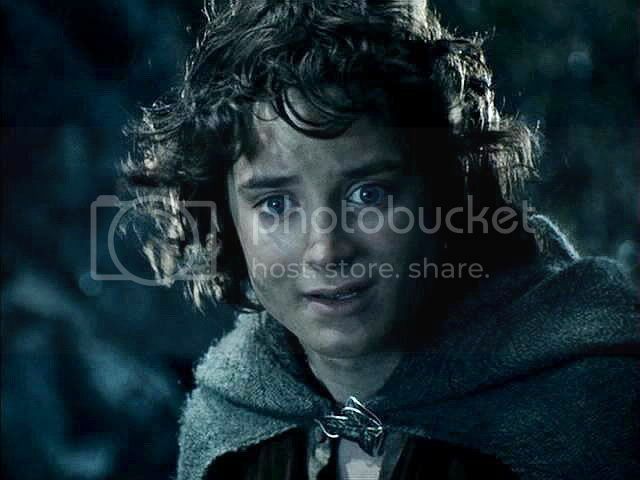 But as I read, imagining Frodo there by the pool, his eyes wide, his ears straining, I picture the hearing of this voice as if it were as potent as the Ring's whisperings to engender negative, discouraging feelings in Frodo. 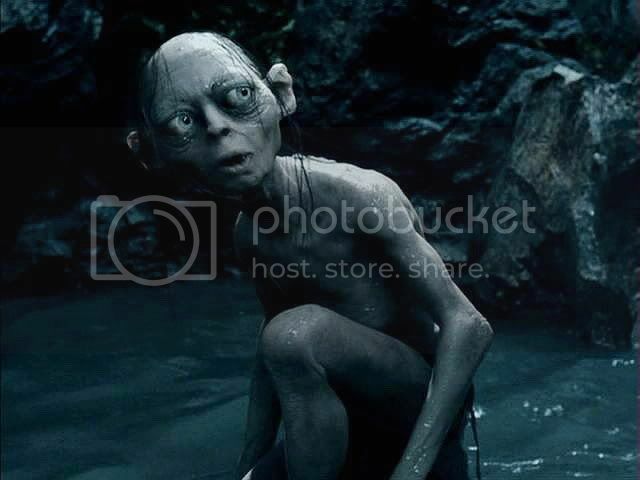 But since in the film Frodo can actually see Gollum the whole time he is talking to him—thus Gollum able to see his expressions and he to see Gollum's—Gollum preserves his separateness as a character. 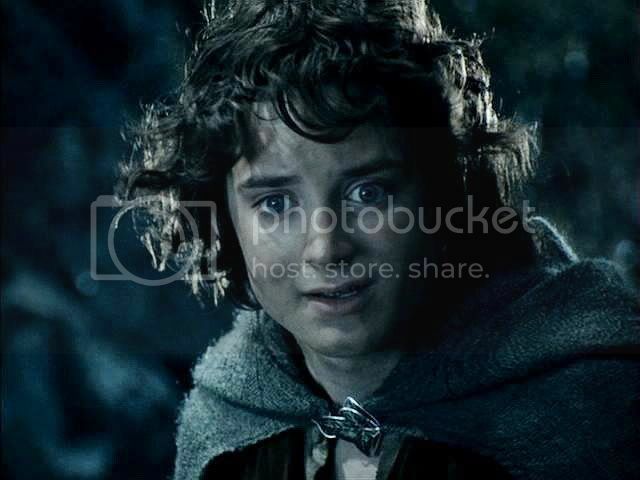 The only thing I truly missed was a clearer sense of the conflict book Frodo experiences as he watches Gollum. He’s disgusted by him, listening to his nasty-minded talk and slavering. But he also is sorry for him. 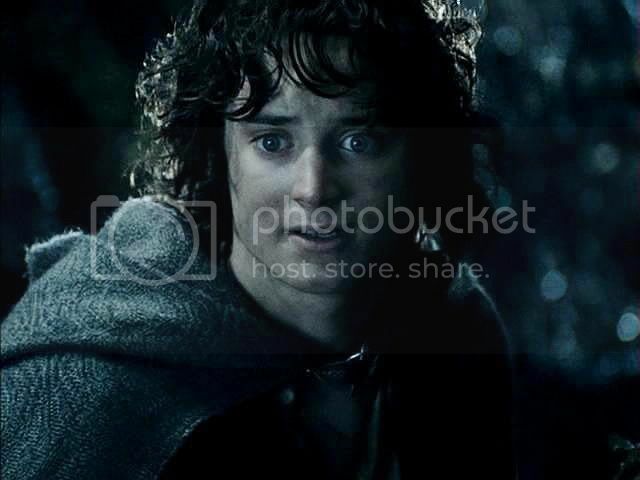 It’s wretched for Frodo. He feels terribly at the thought of ensnaring Gollum through trickery, but also for secretly wishing Gollum really could be got rid of at the twang of a bow—he himself not having to fire a shot. To me, this is another of Frodo's "temptation scenes". Just as in the Emyn Muil he was tempted to kill another for expediency, for convenience, he is tempted here. This has always been one of my favourite book passages for the way it reveals what it is like for Frodo, making difficult decisions about right and wrong actions. 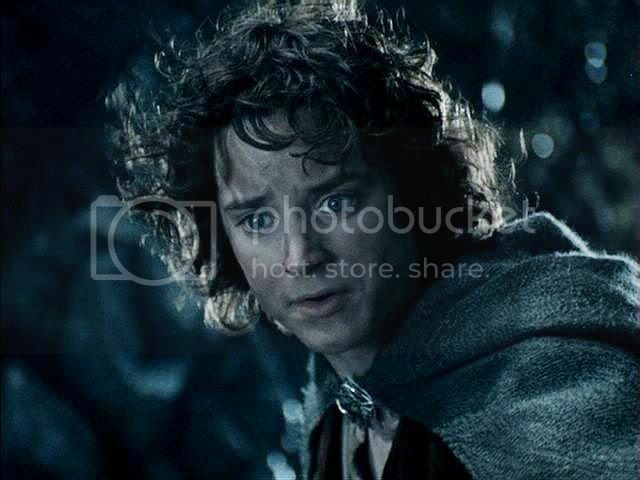 Some of Frodo's intense, ambivalent feelings described in the book do seem to come across in the film scene immediately preceding this one, when Frodo is looking down at Gollum from the ledge. 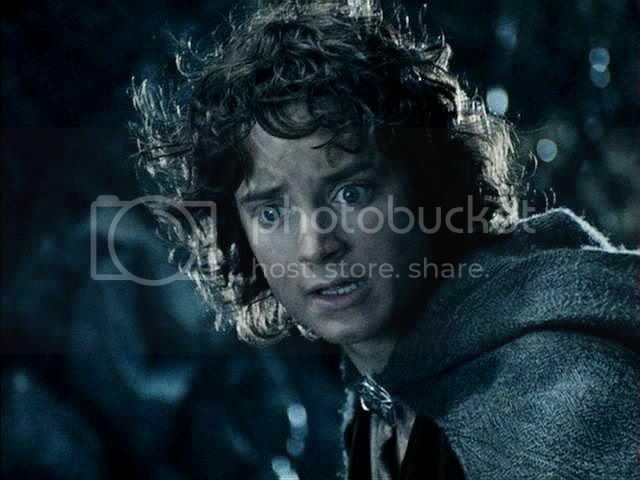 But who knows what Elijah Wood was given to play in terms of acting objectives? Since he’d never read the book, he would have been guided solely by Peter, Fran, and Philippa's coaching and direction—and his own instincts. Whatever they told him, his instincts in the ledge scene were right on target. 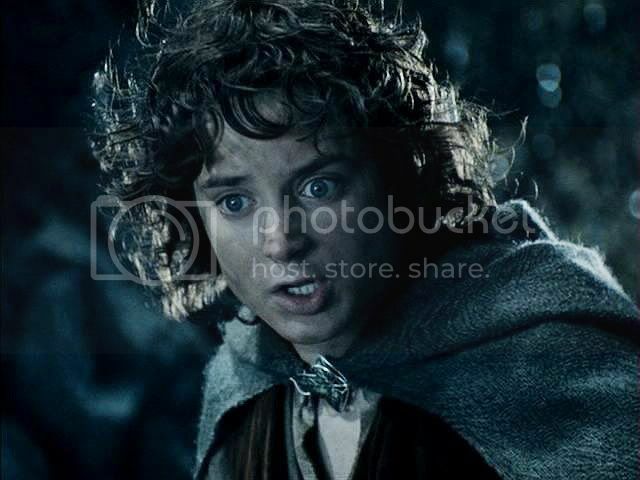 In this scene, Elijah Wood continues to do a remarkable job. My one reservation viewing this scene has been the way Frodo calls Gollum, as he might a dog to get in the a car to go to the vet’s. 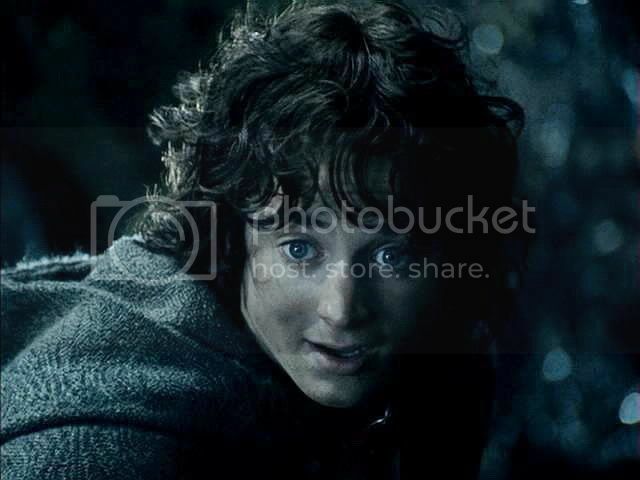 The line actually comes in the second half of this scene, which will be included in the next entry, but Frodo smiles and says cajolingly, "Come, Sméagol. Nice Sméagol. That’s it. Come on." Book Frodo sounds so much more pressed and desperate; he has no time to appeal to "good dog Gollum", and Frodo's winning smiles (if any) can't be seen anyway. Yet there is a "dog" reference in the book text. Book Frodo does not call Gollum as he would a dog, but the Gollum who emerges reminds him of a dog. The reference comes at the end of the sequence. 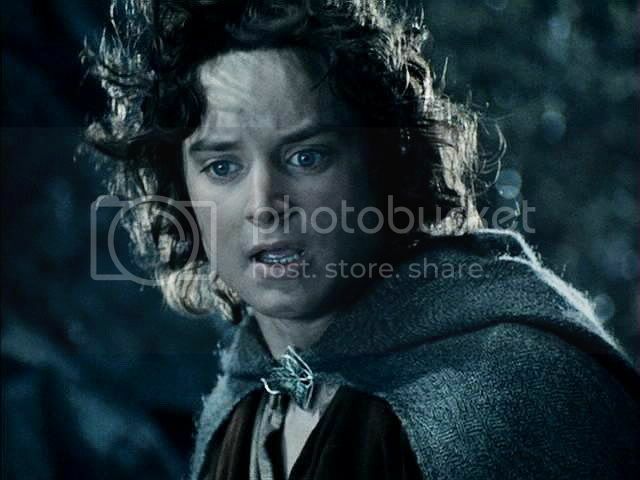 In the darkness, Frodo having to rely only on his words and the tone of his voice, has asked, pleaded, commanded, and finally threatened Gollum (telling him he'll say to the Precious, make him choke on the bones) to lure him out. 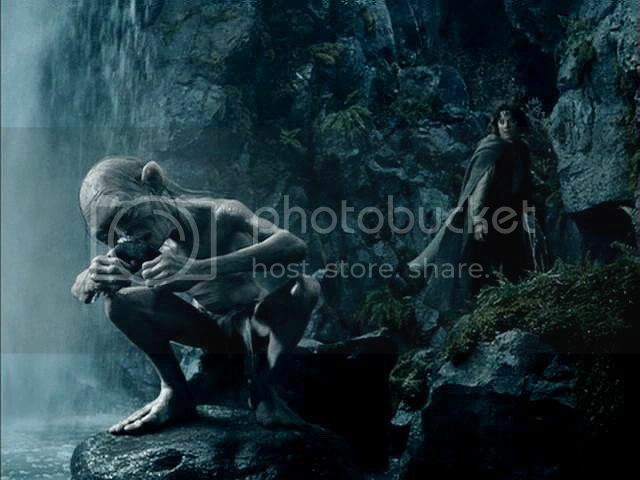 When Gollum finally emerges from the darkness, the description is that Gollum came, “like an erring dog called to heel.” The dog image is not used the same way in the film as in the book, but the dog image is there in the text for the adaptors to use. Actually, there is a Gollum-as-a-dog motif that runs throughout his storyline in the book, when I come to think of it. But a discussion of that must wait for some future post. Suffice it to say that in Tolkien not all dogs are noble and faithful like Huan. 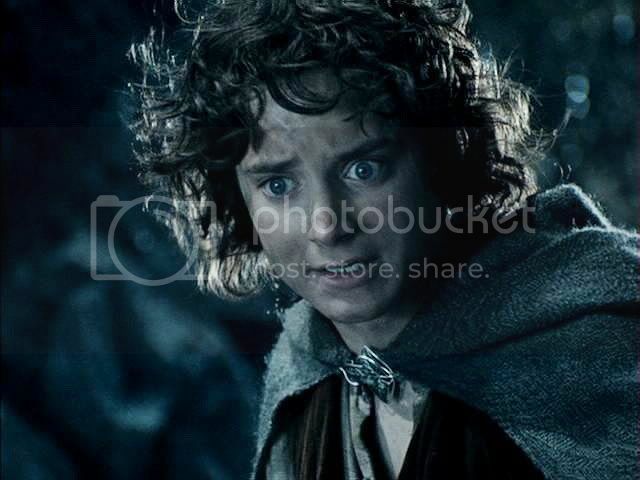 ETA: It occurs to me that I completely overlooked a major difference between the film and book scenes: what Frodo overhears Gollum saying down at the pool. In the book, as Faramir's men draw their bow strings taut, Frodo overhears him saying very nasty, alarming things about him and Sam. 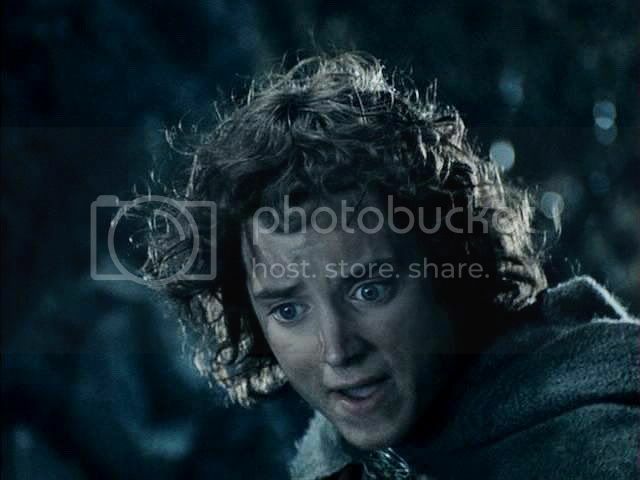 In the film, Frodo overhears (and sees) Gollum singing a little ditty about the pleasures of fish. That's very different. That book Frodo should still feel pity for Gollum, even as he listens to him talking about how he hates him and would like to throttle him, is rather profound. It is less remarkable that film Frodo should feel sorry for Gollum who, while equally ignorant of his danger, is sporting happily and harmlessly in the water. Film Scene: Frodo goes to Smeagol. Faramir allows Frodo to go down to Sméagol. From the bushes, Frodo calls to Gollum, who is eating fish. Frodo: Sméagol. Master is here. Come, Sméagol. Trust master. Come. 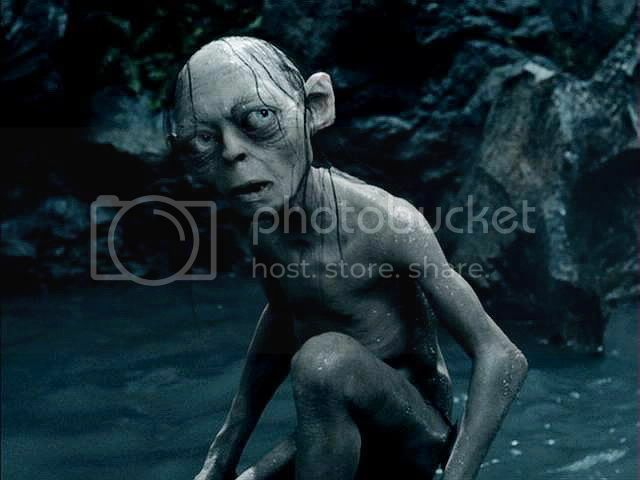 Gollum: We must go now? Frodo: Sméagol, you must trust master. Sméagol, you must trust master. Follow me, come on. Come. ~ Frodo comes to Gollum at the pool. It is pretty "fly away", as the old commercials used to say. As someone with flat, straight hair, I always loved hair that waved and curled all over the place. 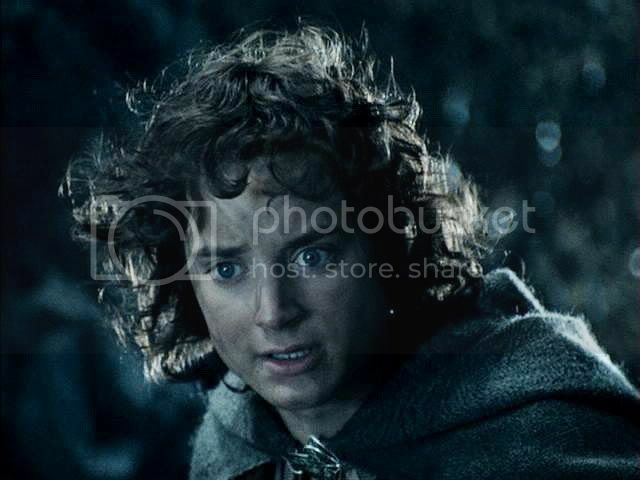 What a treat to see the hair they designed for Frodo! I thought they were going to give him something more like what is described in the book, which sounds a lot more tightly curled and not so long. I loved those big looping waves! 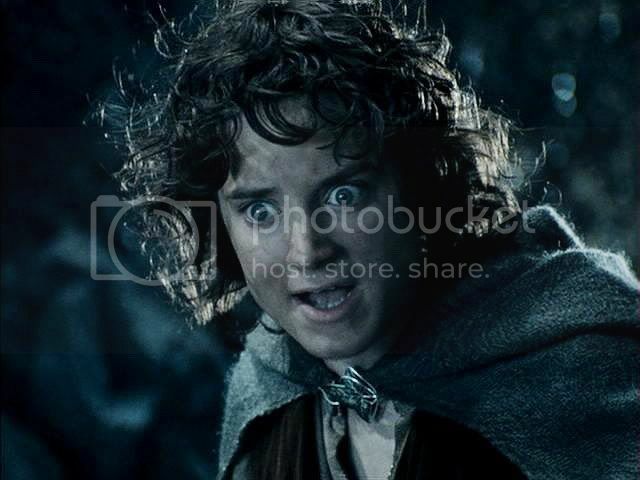 I just love Frodo's expressions in these! Somewhat frigthened, nervous, conflicted, and yet determined and masterful. I just read your fic. I wrote there that it was too bad the sort of scene you wrote didn't make it into RotK. But a lot of opportunities for scenes in which the Men of Gondor (and others) could express their admiration and appreciation for Frodo and Sam were taken away by there being no scenes of Frodo and Sam recuperating on the Field of Cormallen (or, in the film, in the HOH). They just woke up and, presto, they were at the Coronation. Aragorn's bowing down before them had to serve for all. I always cry buckets just from the swell of the music in that scene! But I love imagining the two of them (and Merry and Pippin, the halfling princes, so they thought in Minas Tirith) walking around the camp at Cormallen once they were able, and the soldiers of Rohan and Gondor they passed looking at them with discreet wonder and admiration, some of them coming up to express their wishes for their continued recovery or explicit gratitude. That would helped show so beautifully how revered the little folk were, even among such battle-experienced, able Men. Thanks for the note, Mews. Yes, the dog motif is a strong one. But you're right. Gollum is not a "good dog." Tolkien seems to have had a lot of positive feelings for dogs; there even are dog heroes in his tales (his cats were always villains or the pets of villains). But he seems as aware as anyone that not every dog is good. 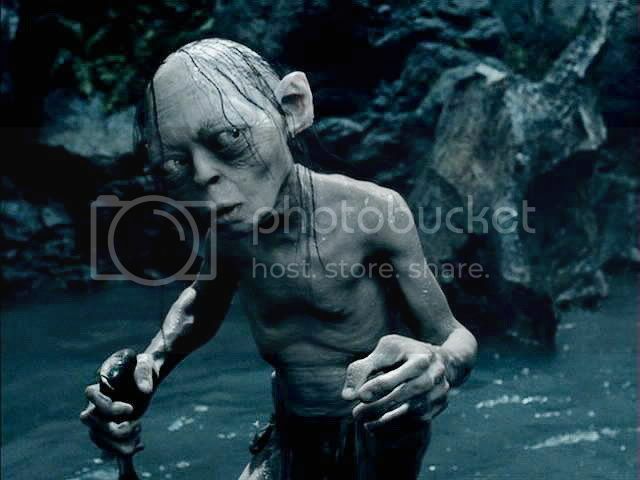 Gollum gets compared to a dog a lot in LotR, but not by Tolkien himself, as narrator. It's always an impression of someone through whose POV Tolkien is writing. It could be a whole thesis, I think, how dog imagery is used in the story. Sam is compared to a dog a few times, too, but to a happy, good dog. Gollum gets compared to strays; whining, cringeing curs--i.e. various sorts of miserable and/or bad dogs. Frodo shivered, listening with pity and disgust. Even in this sorry plight Frodo’s pity for Sméagol prevails. 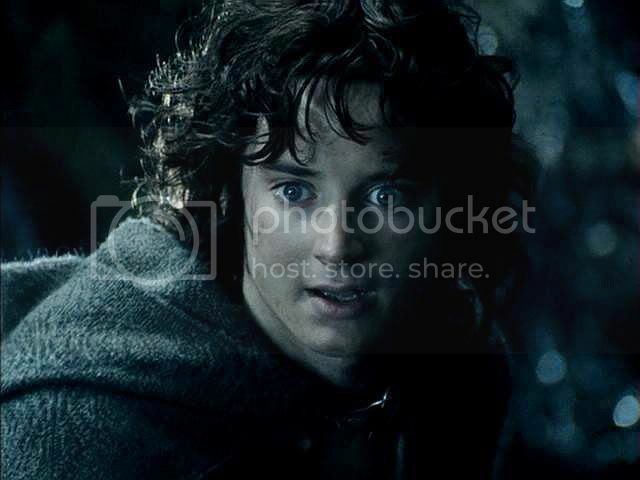 As always, a wonderful post with beautiful images of Frodo to ponder. I’m sure I’m not the only one that appreciates the book passages you insert for our enjoyment. Thank you, Estë. Yes, I love to be reminded of the book passages too. Not only do I love them for themselves, I really do think it's fascinating to see how the adaptors used and didn't use things. On the whole, I think they did an impressive job working from such a huge, detailed text. Sometimes what they did showed genius, other choices seemed reprehensible to me. But it usually always "worked" as drama, whatever they chose. One of my favourite scenes in TTT! I love the cajoling, the 'winning smiles' - and the sight of Frodo's hair blowing in the breeze is more than enough to make me wish I was a young female hobbit skinny-dipping by moonlight in the forbidden pool. Thanks for all the beautiful screencaps, Mechtild. Very inspiring indeed! You are welcome, Frodo's Mum. Any of these would make great subjects for your painting talent. Go to! It’s one of my favourite scenes in TTT, the actors did a fantastic job here – wasn’t Elijah fabulous here? The expression on Frodo’s face shows this so clearly. You can see disgust, fear, insecurity and even pity. When Frodo calls Gollum/Smeagol with that special kind of … let’s say friendliness and the Gondorians get to grap him I shiver whenever I watch this scene. Not because they got him – I’m sorry – but I wonder how must Frodo have felt. I love the book scenes just for themselves, no doubt and everytime it’s astonishing how the actors put it into action. Ha ha! That makes me laugh, Julchen. Yes, EW does a lovely job in all these scenes, whatever they have him do. He's awfully talented and very willing to trust his director. I thought the CGI people and Andy Serkis did a great job with Gollum in this scene, too. And the lighting and set decorating (the "greens dept. ", right?) was perfect.